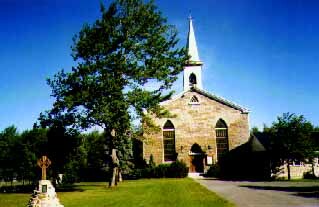 Special services will be held in St. Andrew's Presbyterian Church, Lancaster, September 30th, to commemorate the 175th anniversary of he establishment of the Presbyterian congregation at Lancaster in 1787. --The congregation was established by the Rev. John Bethune,who was the first Presbyterian minister in Upper Canada and the Lancaster congregation has continued to be Presbyterian since that date. The first church building was erected in 1790 and located on the east side of the"old" cemetery. It was a frame structure and the lumber used to build it was brought across Lake St. Francis from Fort Covington. This building served as place of worship for 65 years. An interesting relic from the old church is a dove which is attached to the wall behind the pulpit in the present church.